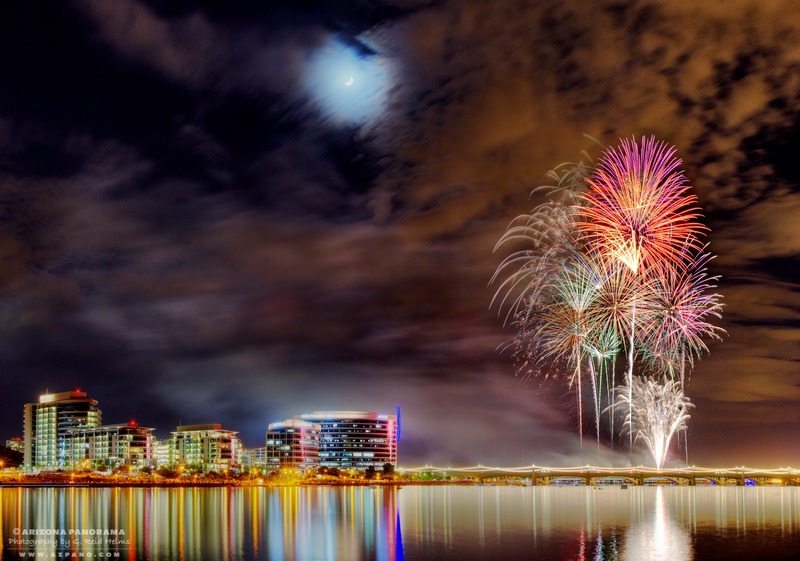 Tempe Town Lake was the location again this year for the 4th of July fireworks celebration. This was the 3rd straight year photographing there. It was a beautiful evening and not too hot. The evening air was still and made for great reflections. I even managed to get a decent parking place close to where I wanted to photograph. Getting out of the parking lot was a completely different thing though. It was 45 minutes before the line of cars in front of me started to move. This year, I settled on the north side of the lake near the marina, east of the bridges where the fireworks were to go off. My friend, Tina and I, got there a couple hours before show time to insure I'd get a good spot. My plan was to position myself across the lake and get a nice base HDR (high dynamic range) panorama shot with the bridge and buildings at Hayden Landing I could then use to add fireworks to. I took a couple panos as the sun set and the twilight began. I love the twilight portion of the night. It's my favorite time of day. Something about the way the the light changes, the sky darkens as the lights of the buildings and streets come up and night settles in is just magical to me. The "blue hour" light at nautical twilight is a time I often use when I shoot real estate and architecture. It makes properties look amazing and dazzles my clients. I had photographed Tempe Town Lake several years ago in the morning blue-light. That image still remains one of my favorites of all time. At the time I first shot the lake, I had no idea about the blue-light portion of twilight. It was a blind luck. The show started and the fireworks were amazing, as usual. It really is the best fireworks display in town lasting around 30 minutes. The shot above was what I was aiming for, a composite with a base shot panorama combined with a variety of fireworks from individual shots. But the best was yet to come. I spent the couple hours before the show talking to a young man also there to photograph the fireworks. It was his first time and I quizzed him about his setup. He seemed to have a good grasp on how to do it. Santiago and I traded stories and he showed me some recent star trails shots he'd done in Sedona on a full moon night. It was very nice work. At one point during the show, I could see he was taking a pano and it occurred to me I didn't have one at this time of night. So, I swung my camera around and snapped a pano, even with the show fully under way. I didn't have much hope my shot would work out. I was bracketing my exposures so I could process the images in HDR. I couldn't imaging how the fireworks would be okay. Along with multiple bursts going off during the exposures, the bursts were cut off on the second frame of the three frame pano. The next day, I processed the images and built the panorama. I was more than surprised to see my quick pano during the show was the best shot of evening. I had captured the moon, clouds, smoke and a series of the fireworks that my stitching software had handled perfectly. The HDR processing added lots of detail that my straight shots didn't have. Even the fireworks themselves had more depth of color and texture. And the best part was it wasn't a composite with a base shot and fireworks added in post processing, but all captured in one series of photos. I did obsess over the image for the next couple days. I must have reprocessed it a dozen times, dodging and burning and making countless adjustments before finally tweaking the individual frames to get a stitched pano I was happy with. It also was a final image that didn't require a lot of extra manipulation in Photoshop. Mistakes like these are always a good way to learn something new. Even though I hadn't exposed the panorama correctly, I did finally figure out a way to make it work. It just took some time. Social media went crazy with approval. I had over 400 likes on the Photography Adventures Club Facebook page, 100 likes on my own FB page and over 2,100 views on my SmugMug gallery. Some of the better comments claimed it was the best 4th of July fireworks photo they had ever seen. I was more than flattered and grateful to those who took the time to comment. It felt good to be recognized for my efforts, and I even managed to sell a couple prints. It was a magical evening and one I was proud to have captured so well.